eBay remains a great stock, but these two e-commerce powers are better buys today. Tech investors face a unique challenge. Unfortunately, the downside of the industry's penchant for disruption is that it makes staying power hard to come by, though not impossible to find. Thanks to their business models, some areas of tech actually lend themselves quite well to developing moats, or what some investors like to call durable competitive advantages. One such example is e-commerce, a business whose tendency to create network effects for buyers and sellers has made a handful of companies into household names with long-term track records of success. Case in point, marketplace eBay (NASDAQ:EBAY) remains the go-to destination for online auctions 21 years after its founding. However, for all of eBay's admitted success, it isn't necessarily my favorite e-commerce company to invest in. Here are two e-commerce stocks I like more than eBay. As the saying goes, imitation is the greatest form of flattery, which certainly applies for the "eBay of Latin America," MercadoLibre (NASDAQ:MELI). One of the most widely recommended stocks on our premium newsletter business, MercadoLibre is a gem of a company indeed. Founded in 1999 by an Argentinian entrepreneur with a Stanford MBA, MercadoLibre has grown into the largest e-commerce operation in Latin America. Today, its operations span 18 countries and a population base of 550 million people. Better still, like eBay and Amazon.com (NASDAQ:AMZN) in other parts of the world, MercadoLibre is synonymous with e-commerce in its region. According to its management, MercadoLibre ranks as the most visited e-commerce website in each of the markets in which it operates. This heightened brand awareness and latent market potential make MercadoLibre a truly compelling growth opportunity. MercadoLibre's sales are expected to rise 33% in 2017 to $1.1 billion, a pittance in the overall context of Latin America's e-commerce ecosystem. In fact, researcher eMarketer believes total Latin American e-commerce sales will increase from $49 billion this year to $80 billion by 2019, leaving ample room for continued long-term growth for MercadoLibre. In fact, even eBay agrees with MercadoLibre's investment thesis: It purchased 20% of the company in 2001. Even as it prepares to sell its stake, eBay says it remains committed to its long-term cross-border partnership with MercadoLibre. If that isn't a vote of confidence, I don't know what is. What this pick lacks in creativity, it more than makes up for in usefulness. Don't get me wrong -- I'm a big eBay fan. However, if their past decade of revenue growth bears any indication, Amazon's "everything store" model is likely a larger opportunity than eBay's online auction platform strategy. AMZN Revenue (Annual) data by YCharts. The chart above captures their differences nicely. Given Amazon's success, it's easy to dismiss eBay as a vestige of a bygone era. However, that clearly isn't the case. eBay's revenue growth is indeed a genuine feat; few businesses ever accomplish as much as it has. 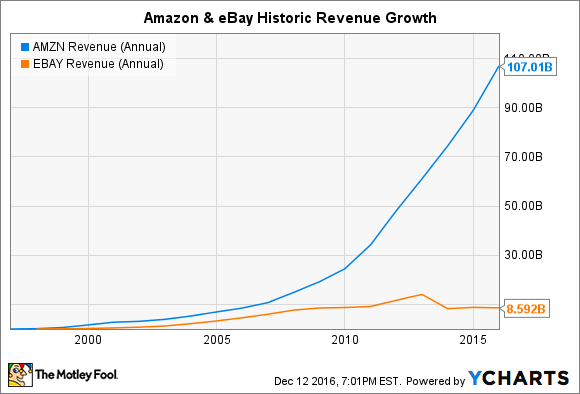 At the same time, though, there can be little doubt that Amazon's growth opportunity is greater than eBay's. Thankfully for investors worried about having missed Amazon's investment opportunity, the company still enjoys ample run for future growth. Though we tend to think of Amazon as a mature company -- and in some ways it is -- e-commerce as an industry remains very much in its infancy. According to the Department of Commerce, e-commerce sales in the U.S. alone accounted for just 8.4% of total retail sales in Q3. Of course, it isn't clear how much of total retail sales e-commerce players like Amazon can capture, but it's assuredly quite a bit higher. What's more, Amazon clearly sees an opportunity for continued growth. In fact, Amazon is experimenting with developing its own global logistics network, itself a potential $400 billion opportunity. Amazon could certainly decide against pursuing such an audacious plan. However, as key business drivers like Amazon Web Services (AWS) or Prime demonstrate, Amazon revels in taking these kinds of bold, disruptive bets. Amazon Web Services -- Amazon's leading cloud computing platform -- reached $10 billion in sales faster than Amazon's e-commerce operations and remains the leader in the generational transition from mainframe computing to cloud computing. Similarly, Prime has emerged as perhaps the key to help incentivize the growth of Amazon's e-commerce business. The company's revenue only recently surpassed $100 billion, but Amazon.com is only getting started in its generational pursuit to completely rework the way people around the world shop.